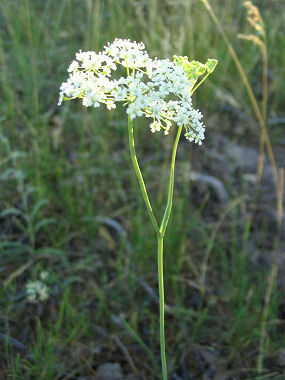 Parish's Yampah is a member of the Parsley or Carrot Family. The plant grows to 3 feet in height and has 1 - 2 dark green leaves per stem that grow to 3.5 inches in length. The plant typically grows in mountain meadows and in moist pine forests at elevations between 6500 - 8000 feet. The roots of Parish's Yampah are edible and were an important food source for Native Americans and Pioneers. They supposedly taste like carrots. 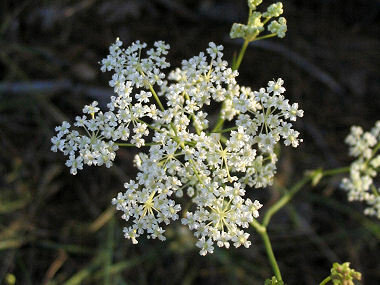 Parish's Yampah blooms between July - September and produces a 2 inch wide flat topped cluster (or umbel) of tiny white flowers with 5 petals that are 1.8 inch in width each.